You know how when you begin praying about something, it sort of seems unlikely that you'll receive an answer, but you pray anyway because you know that's the right thing to do? And, then God surprisingly and gently begins to unfold an answer before you over your whole life, and you have to remind yourself that it's not surprising at all because that's what He said He would do? Well, I can point to some specific times in my life where that's been the gist of the story. And those times are my most sacred spiritual treasures because they remind me that This. Is. Real. and I haven't conjured up some drama in my mind or fallen victim to a weird mass-mentality thing. I'd like to share here a letter that our ministry supporters should be receiving in their mailboxes right now. And, then, if you're still here, I'd like to tell you the longer version of the story. And, if in your generous, faithful friendship to us, you'd like to keep checking in, we'd like to answer your questions and bring you a little further into our journey of ministry. In a recent web update to you all, I described my feeling of “eager expectation and hope” that was captured so eloquently in Philippians 1. We’ve described to you the process we’ve been through over the past 6 months to determine “what’s next” for our family as far as ministry is concerned. To sum it up, you might remember that in July, Ben felt certain that God was leading him to step down from his role as the director of AIA’s Global Leadership Council. This was heart-wrenching for both of us, for a variety of reasons - mostly because in that role we really felt as though we’d found our God-planned “fit” into His work here on earth through Athletes in Action. However, the depth of commitment and the amount of travel the job required was really not possible with the challenges we were facing medically. So, though it hurt, we let it go. It was really a beautiful gift that Ben gave me - to say goodbye to something he loved so that he could love me better. Ben remained insistent that he didn’t need to know what was next in order for him to know it was time to stop - and he lived that conviction with courage. But the question - Now What? was a natural one for us and for all of you who have supported us in our ministry. You all (and AIA) have been so gracious in giving us the time to first deal with the challenges facing our family, and then to wait on God before we answered. As we’ve prayed, we’ve been able to clarify a few priorities. This next season of our life together feels like a carefully-wrapped gift. We want to accept it, determined to LIVE, to grow closer together as a family, to LEARN more about God in new ways, and to SERVE some national staff whom we love and respect in a very critical time of their ministry. So, it is with eager expectation and hope that we ask you to pray with us about a specific ministry opportunity that we believe God has been leading us towards. What we are considering is moving to Brazil for three years (September 2013-December 2016) to help AIA’s national staff team lead and grow their ministry during a very unique time in their history. At the same time, we will be connecting with many sports ministries who have their eyes on Brazil for the Olympics and World Cup. Also, Ben will be continuing with his Doctor of Ministry, and what he is learning there ties in beautifully with what we see happening in Brazil. This is timely for us because of my tenuous medical prognosis that seems to be opening a small window of freedom. This is timely for AIA because, for the first time ever, the World Cup of Soccer and the Summer Olympics will be happening in consecutive years in the same country, We also believe this is timely in the history and future of the Church as God continues to work in the Global South to build His Kingdom. I hope it’s clear that this decision is not final. Moving to Praia Grande, Brazil (near Sao Paulo) is what we want and are hoping for. We’ve prayed about it and sought counsel from people who know us well. Now, we’d like to invite you, our ministry partners, to begin to pray with us for God’s continued direction in this decision. There is a small mountain of details that we need your help and advice (and prayer!) in tackling, so we will be updating our website with lots of questions and projects and needs as we move forward. And, if God closes the door on this adventure, we will be sad, but we will be obedient. Please pray for us. Oh wait! You have questions! We can predict a few of them: What about medical care? How will you educate your kids? Are you insane? What does your family think? For now, I’ll just assure you that we’ve asked ourselves all of these questions and have felt God’s gentle assurances. We’ve also begun the careful process of seeking answers, and will do our best to share what we’ve learned. To start, we are confident we are not insane. As far as family goes, I’d hope they’d be a little sad to see us move further away, but they’ve expressed their support and encouragement. However, understanding your potential curiosity, we asked my mom to weigh in. She wrote a letter to you, and we’re posting it on our website for you to read. The process and mechanics of how we are sent. Housing - here and there. Finally, we (without the kids) are planning to take a vision trip to Brazil next month to begin exploring some of these details in person. Feel free to keep the questions coming (call or email Ben). And thank you for your faithful prayers - you’ve taught me so much. In 2003, we went on our first international tour together with AIA to Sao Paulo, Brazil. We helped lead a team of young basketball players, doing clinics, playing games, sharing the gospel, and completing our time with a week-long basketball camp hosted by Atletas em Acao (AIA Brazil). Our time there was so special because it was the beginning of our international experience at AIA, and because it was there we met the staff of Atletas em Acao, and began to fall in love with their families. And speaking of my parents, here's the letter they wrote you, is right over here. 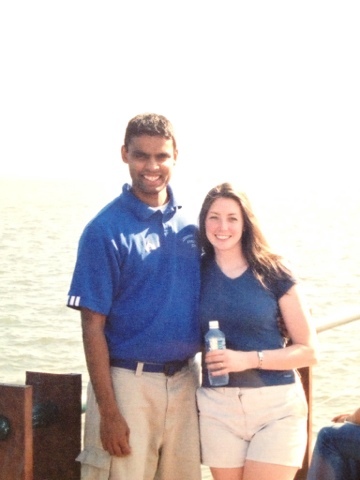 This is a picture of me and Ben on our first trip to Brazil - not too far from where we hope to live - in 2003. Hi, Ben and Suzie. This is Heather Focht, one of Sarah Kuhlman's friends. I'm so glad to hear that the chemo is over and that you have this fantastic opportunity. While you are considering medical options for the kids: The International Adoption Center at Cinci Children's has talked about being sort-of a "doctor on call" for families that are expats, helping them to make sense of local medical care and providing care to the kids when they might be state-side for a trip or the like. In addition, they have started a new travel clinic that takes insurance for kids and adults that can help you get immunizations, set up your prescriptions, etc. Thanks Heather. We will have to check on this. Even if... I am glad and rejoice!